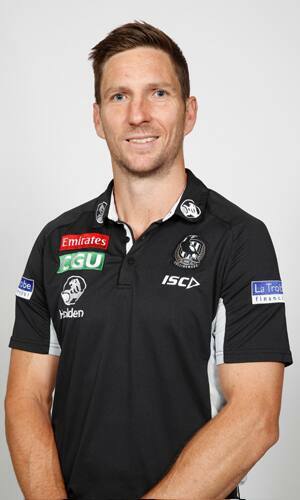 Western Bulldogs Premiership player Matthew Boyd began his transition into coaching by joining Collingwood in the 2018 pre-season. Charged with helping develop the club’s emerging players, the 292-game veteran adds a fresh perspective to the coaching panel. He retired at the end of 2017 after 15 years with the Bulldogs. Boyd’s playing career exhibits the story of a determined athlete who overcame adversity to reach the top level of football. After being selected with pick 22 in the 2002 Rookie Draft, he currently hold the VFL/AFL record for most games played by a rookie-listed player. Career accolades include three Western Bulldogs Best and Fairest awards, three All-Australian honours and captaincy of the Bulldogs between 2011 and 2013. While this leadership will no doubt translate to coaching, the team success which came late in his career will also be a source of knowledge to share with Collingwood’s young group. At 34 years old, Boyd had 27 disposals in the Western Bulldogs drought-breaking Grand Final win over the Sydney Swans in 2016.